When we pronounce the word «crab», we usually think of sea creatures. However, out of 6.5 thousand species of crabs (Brachyura infraorder) more than 1.4 thousand species inhabit fresh waters, and most of them (1.3 thousand species, 8 families) are exclusively freshwater. That is, they inhabit fresh water constantly during their life, or are connected with fresh water temporarily or are completely terrestrial animals, and their development is not related to sea water. 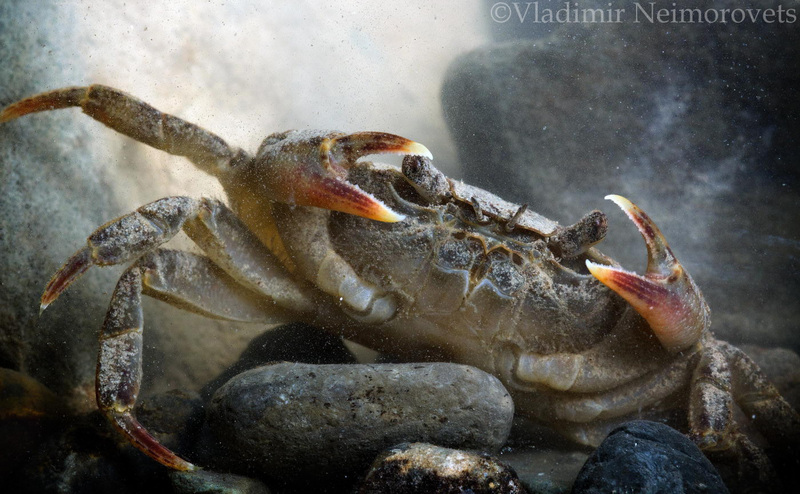 One fresh water crab species, the Potamon ibericum (family Potamidae) are distributed in Russia (the Western Caucasus and Crimea). The species was described in 1808 by Fedor Kondratievich Bieberstein (traveler, naturalist, botanist and sericulturist) after his travels to Georgia. The species is named after the ancient kingdom of Iberia on the territory of modern Georgia. It is noteworthy, but the species is absent in the Iberian peninsula. Before the Pleistocene period (about 3 million years ago), species of the Potamidae family were widespread in Eurasia, but the Pleistocene glaciations greatly reduced the areals of most of these thermophilic species, and many of it died out. The current area of ​​ the Iberian potamon’s distribution is fragmented. 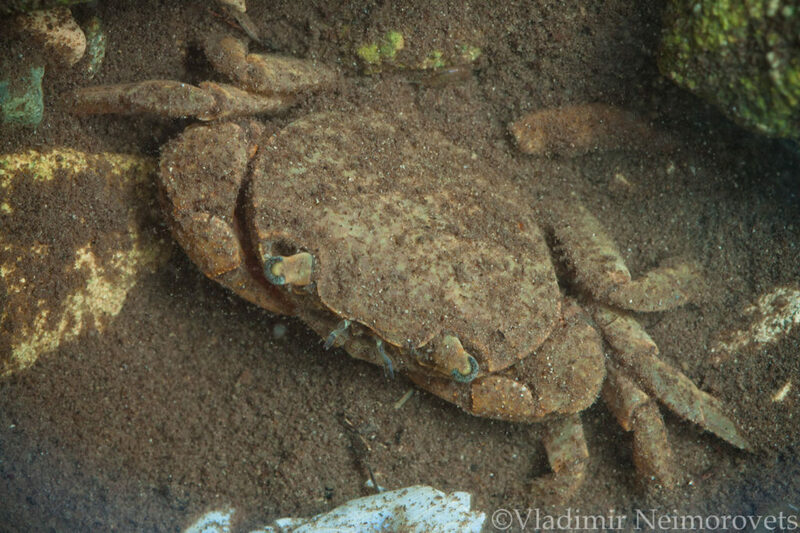 The crab is locally found in the Eastern Mediterranean (Bulgaria, Macedonia, Greece, Cyprus, Turkey), in the Crimea, the Caucasus, Iran and Turkmenistan. And not so long ago, in the 70-80’s of the last century it was introduced into small rivers of southern France. 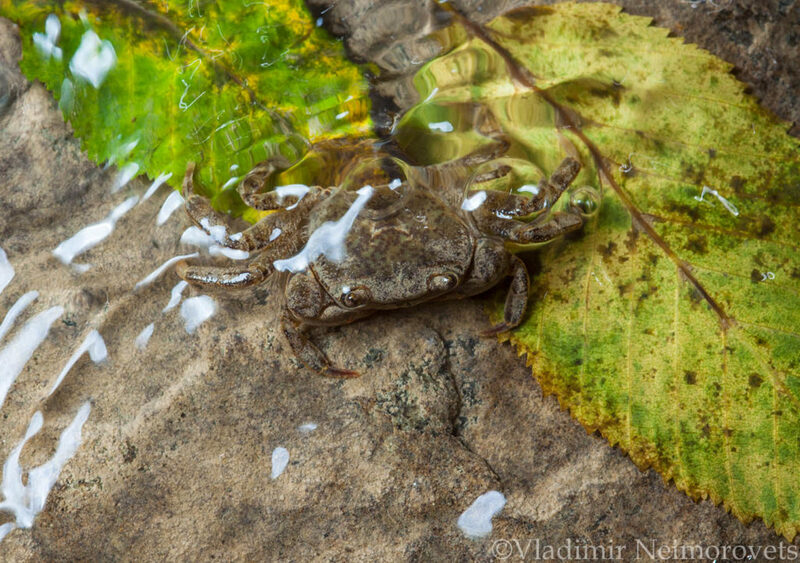 These crabs live only in foothill and mountain small rivers and streams with clear, hard and slightly alkaline water with high oxygen content. It is necessary to have stones under which the crabs hide. If the air is sufficiently humid, they can live without water for long enough in the litter under the canopy of the forest. Adult crabs eat everything: detritus, parts of aquatic and terrestrial plants, feed on live and dead crustaceans, amphibians, water-insect larvae and other invertebrates, can actively hunt. 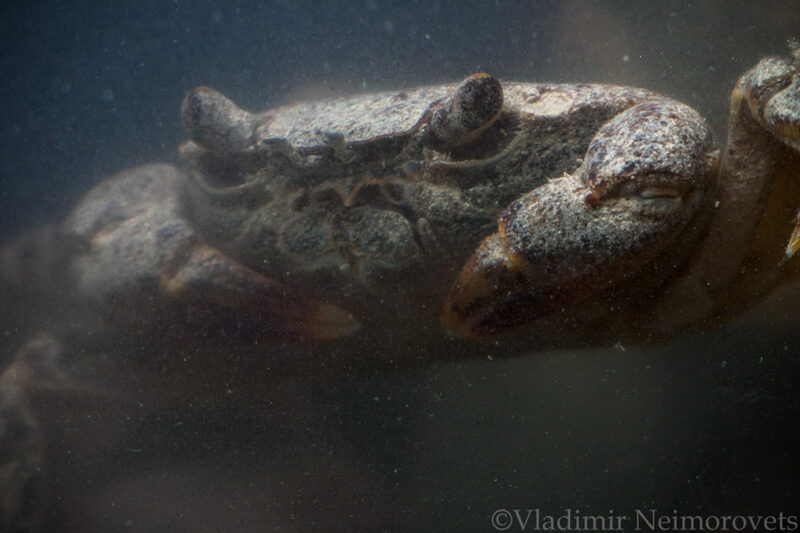 These are territorial animals — the adult crab occupying its area, protects it from encroachments by other crabs. According to observations, the crabs are rather aggressive, they fight so that they lose limbs that are restored after the next molt. They reproduce during all summer months. A female carries it’s eggs (up to 600 pieces) on the abdominal legs. About a month after laying, the larvae hatch. After some time they molt and turn into small crabs. The females becomes an adult after three years of it life, and the males after four. They moult every year. The duration of the crab’s life can reach 15 years. 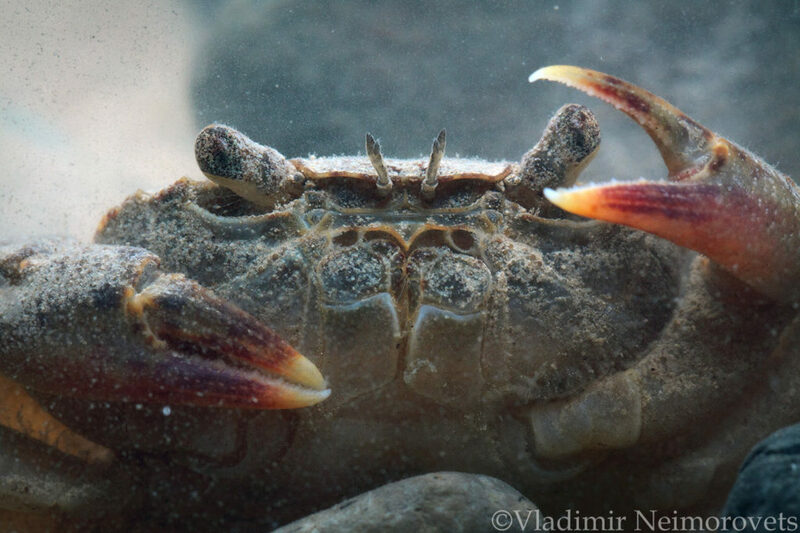 Unfortunately, in Russia the number and areal of this remarkable crab are shrinking. There are several reasons for this. Two main reasons are the reduction of habitable places and direct destruction. 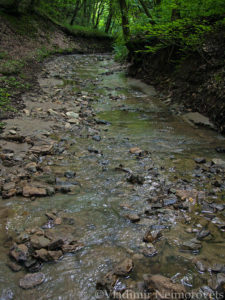 Due to an increase in average annual temperatures and a decrease in the amount of precipitation, and also because of the shrinking of forest areas, many streams began to dry up. The so-called recreational load has increased — the popular routes off-roading follow by along some streams now. Crabs became quite popular objects with fans of exotic animals and every year these lovers of nature are caught a significant number of them. But at home they are difficult to take care and reproduct, it is only possible for experienced aquarists. And one of the biggest threats is that the crabs are actively destroyed by common raccoon (Procyon lotor) that which was successfully introduced from North America to the Caucasus. The Iberian potamon is included in the International Red List of the IUCN, the Red Book of Ukraine (2009), the Red Book of the Krasnodar Territory (2007), the Red Book of the Republic of Adygea (2012). In these Red books the species is indicated as Potamon tauricum (Czerniavsky 1884). Regarding the taxonomic status, systematicists do not yet have agreement. According to the World Register of Marine Species the name Potamon ibericum is valid.